If you are heading to the Caribbean, this is one guide book that is a must to have on board. It is the first comprehensive illustrated guide to the natural world of the Caribbean islands. With 600 exquisite colour images, it is an ideal field guide that will spark the imaginations of everyone on board. The text covers 451 species both terrestrial and marine, selected on the basis of most likely to be seen. Each has at least one image associated with it. The geographic coverage includes the Bahamas, Greater Antilles, Virgin Islands, Cayman Islands and Lesser Antilles. Trinidad and Tobago and the ABCs are not covered. The book begins by exploring the issues in general, including biogeography, climate, lost faunas, habitats, the influence of hurricanes, folklore and environmental threats and conservation. The book then moves on to Terrestrial Life including plants, mammals, birds, reptiles, amphibians, and invertebrates in colour coded sections. This takes up 228 of the 304 pages so it is the majority of the text. Marine life is not given short shrift though. Marine mammals, reptiles and fish are covered in sufficient detail to assist in identification and learning. Fish are separated by where they are likely to be seen – reefs and sand/grass flats or open water game fish. Marine plants and invertebrates follow before closing on sea shells or mollusks. Each species is introduced with a set of key features intended to assist in identification in the field. The language is plain English and suitable for all audiences. What I really liked is that one guide covers all the wildlife most likely to be seen rather than just one type, so you need carry only one book. Herbert A. Raffaele worked for more than four decades directing wildlife conservation for the Puerto Rica Department of Natural Resources and served as chief of Latin American and Caribbean programmes for the US Fish and Wildlife Service. James W. Wiley has conducted ornithological research throughout the Caribbean since 1972. 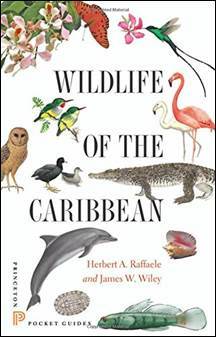 Raffaele and Wiley previously collaborated on Birds of the West Indies also published by Princeton Press. 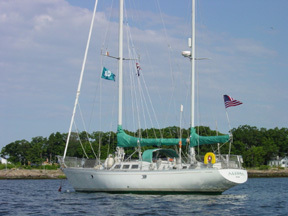 What they have produced is invaluable for the Caribbean cruiser. I wish we had had access to it when we sailed there. Perhaps we’ll just have to go back.